Counting sheep again? Insomnia plagues millions of Americans, so know that when you’re wide awake and staring at the ceiling at 2 a.m., you are not alone. If lack of sleep due to stress (and not because of a medical issue) is affecting your sleep, consider going the natural route. For some, herbs can provide enough relaxation to catch up on missed beauty sleep. Here are nine to try. For years, Passionflower has been used to treat anxiety and sleep irregularities. The herb contains Flavanoids, which help relax nerves, making it one of the top choices to treat insomnia. Available in tea, capsules, or tincture. Valerian root has long been used to remedy sleep disorders and is considered safe in small doses. You can find valerian at your neighborhood health food store, and some drug stores sell the herb too. You can tell valerian by its putrid odor. Most often used in combination with valerian, hops has a sedative effect, and that could be all your body needs to fall asleep. 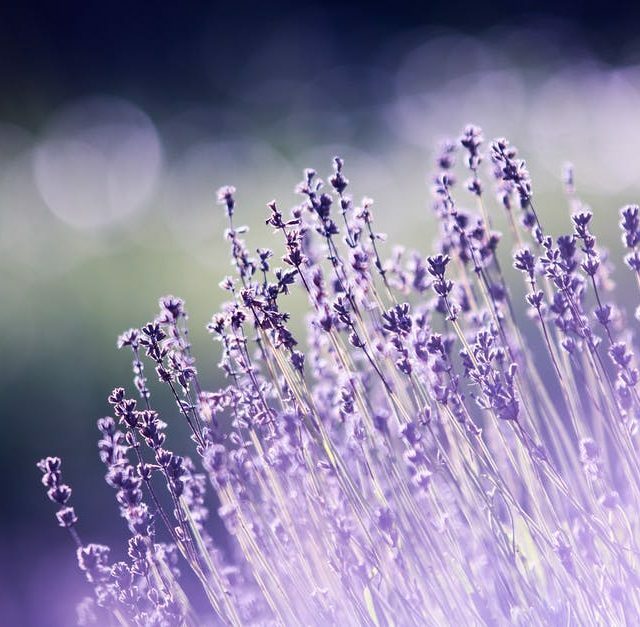 Even the scent of lavender is enough to relieve sleeplessness for some insomniacs. Try a lavender tea, massage essential oil into your skin, or add it to your bath water. 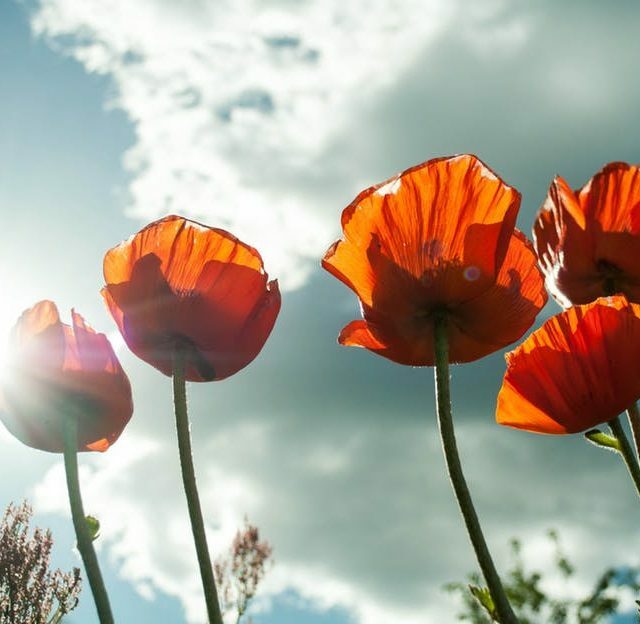 California Poppy is a natural sedative. This sleep-promoting herb will ease your mind until you drift off into dreamland. 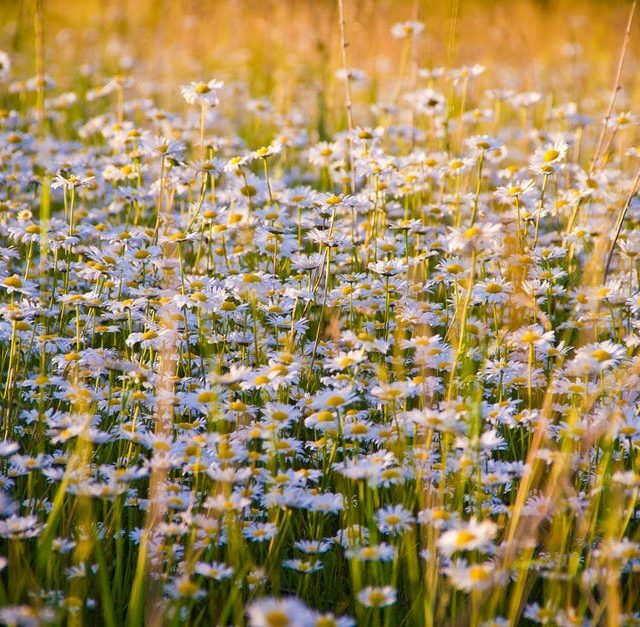 While chamomile might not be potent enough to address chronic cases of insomnia, it does have a mild tranquilizing effect for those occasional sleepless nights. Have you had any luck with herbs for insomnia? Daylight is lingering, flowers are blooming, and robins are chirping. In case you didn’t know– we’re well into spring. If you haven’t given spring cleaning any thought, shame on you! Now is the time to refresh your bedroom before temperatures heat up. We still have a good two months left of the season, so get busy and start your spring cleaning with this list. Find a place for any item that doesn’t have one yet (in a closet, in a drawer, stored under the bed), and donate all those items that you don’t need or wear any longer. A good edit will give you a great sense of accomplishment and prep the space to be cleaned. I bet you’ve never cleaned your walls, have you? Take a dust mop and run it up and down the walls, including up at the ceiling line. Get on that ladder of you must. Sweep all those tough-to-reach places like corners and around door casings, lamp shades, and upholstery. After vacuuming, any upholstered furniture that still appears worn or dirty should be professionally cleaned, or perhaps recovered (see the next point). Clean and spruce up fabrics. Wash all bedding (that means the bedcovering, shams, and mattress pad too), and what you can’t launder, send it out to get professionally cleaned. If you have any other upholstered furniture, window treatments as well as area rugs or carpeting in the bedroom, now’s the time to call in a professional and get those cleaned too. Notice some tattered fabrics? Spring is an ideal season to recover those older pieces. Wash down woodwork, floors, and all furnishings including lamps and accessories. Opt for a mild cleaner like Murphy’s Oil Soap. Be sure to give your wood floors a deep cleaning and use a touch-up pen or Old English to cover scratches. If you have stone in the room, use a stone cleaner. An all-purpose cleaner from Method works wonders on many materials. Don’t forget the mirrors, art, and windows. 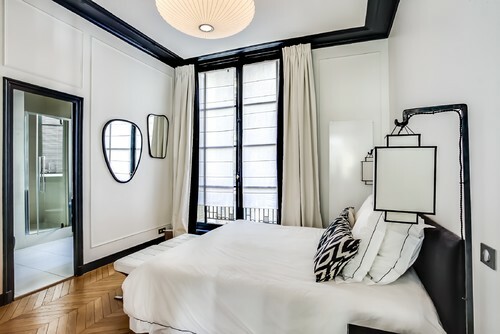 Windex mirrors and art, as well as windows (inside and out) so the exterior looks brighter, which will, in turn, make the interior of your bedroom shine too. Light a candle, spray your favorite fragrance, or purchase potpourri. Lavender and sage work especially well in a bedroom. No place in the world is as alluring as Paris. 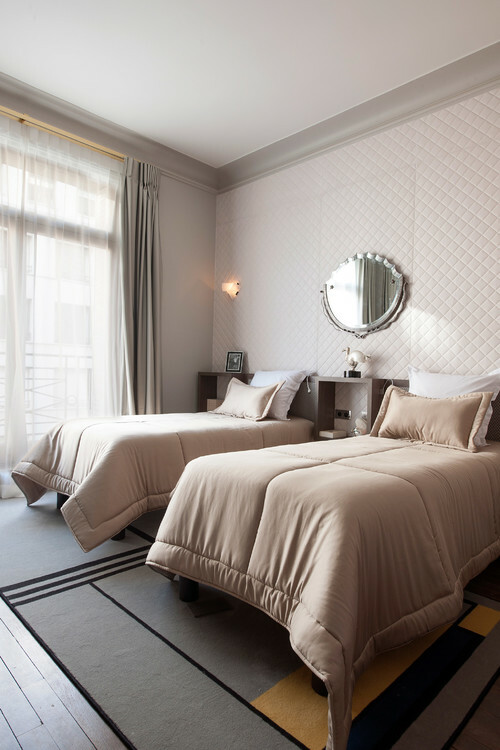 In fact, the French city has long been recognized for its classical architecture and beautiful interiors that keep many of us dreaming of staying in a sophisticated Paris apartment. Even if you can’t take that much-needed vacation to Paris right now, you can pretend. Here are five romantic Paris bedrooms that will whisk you away to the City of Light. 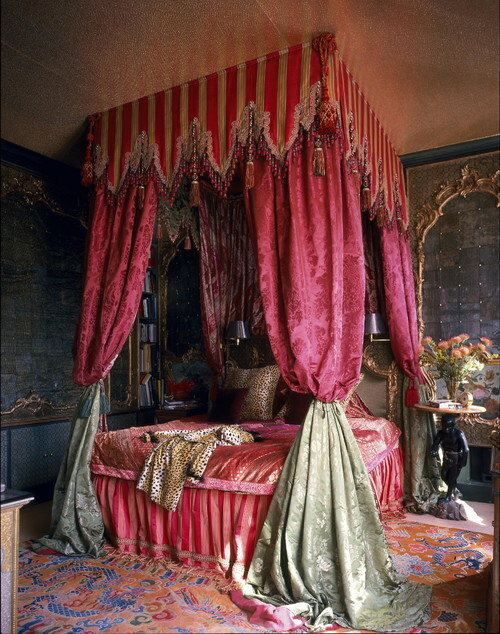 This Paris bedroom boasts a mystique with its canopy-draped bed, silk fabrics, and red color scheme. Notice the splash of animal prints. This bedroom feels unmistakably chic and romantic. Photo by HUTTON WILKINSON – TONY DUQUETTE INC. 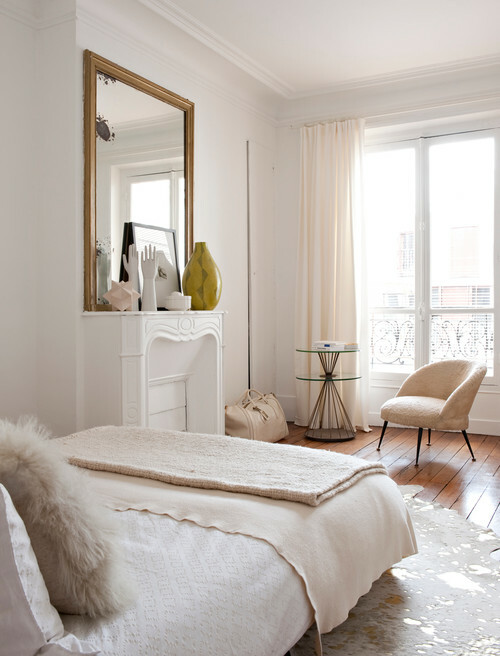 Touches of wood complement an all-white color scheme in this streamlined Paris apartment. Perfectly accessorized shelves and simple bedding complete the look. 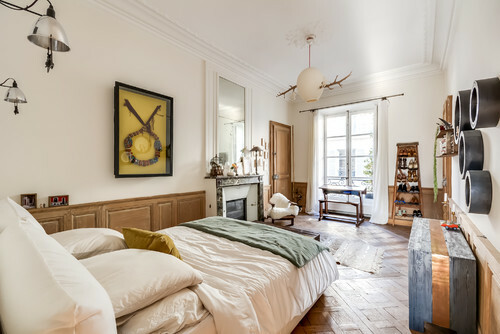 A fireplace and balcony are practically expected in a Paris apartment and this transitional bedroom offers both. The neutral palette lets the architecture shine. A tiny tropical bedroom with red walls is gently carved out of a small space. Technically, there’s no headboard, but a half-wall creates a backdrop for the bed. An eclectic bedroom looks interesting from all angles. Parquet chevron floors, tall ceilings, wide crown moldings and a collection of unusual art and accessories give this space a Bohemian vibe. Upholstered walls create softness in a twin bedroom in Paris’s 5th Arrondissement. Simplicity lends itself to the space, and there’s something elegant about the no-frills decorating approach. Medium-toned parquet floors and a black and white color scheme set the stage for this remodeled Parisian apartment. A risky design move, the black trim makes a statement and is further accentuated by the funky black bedside lamps. Now that spring is here, we should all look at how we can edit our homes, and eliminate those items we don’t need. In the bedroom, it’s easy to accumulate various things, especially since guests tend to stay in our living space and not enter our personal space. Are you feeling overwhelmed by clutter? Try any, or all of these suggestions to keep your bedroom clutter-free. Drawers barely closing? For every new pair of socks or t-shirts you buy, throw away an old pair or shirt. That sock drawer did close at one point, and it should close again. If your closet is out of space, it’s time to purge. Pull out warm coats and thick winter clothing in spring and place in storage or an extra closet. In fall, remove summer clothing and store until the following year. Keeping your closets organized will help you keep piles off the floor, bed, and other furniture. Magazines are tempting to keep (I’m guilty), but with most publications now on the web, there’s no reason to keep back issues unless they’re collector’s items. Purchase bedside tables with drawers. Declutter your bedside tables (or floor next to the bed) when you invest in a nightstand with drawers. Keep your miscellaneous tchotchkes tucked away. Adding drawers under your bed is a practical way to stay organized, especially if you have limited drawer space or no dresser. Our universal under-bed storage boxes fit under any bed with a minimum of 7 ¼” clearance from the floor. An unmade bed might not have anything to do with clutter, but I promise – making the bed will give the illusion that your bedroom is clean and organized, and that’s a great start. Living in one room has its challenges for sure, but small spaces can be incredibly stylish and convenient. There’s something wonderful about having everything you need (almost) with an arm’s reach, and studio life allows that. Single room residences aren’t ideal for overnight guests, and for some, they work for a specific time in life. Many folks eventually outgrow the living/dining/sleeping combo and graduate to a one bedroom or even a house. Nonetheless, studios can be fabulous, as you can see in these five apartments. This Hoboken studio is not only chic, but the narrow space offers great storage. Designer Marina Cheban used IKEA bookcases for the client’s shoe collection and added an armoire for dresses. I’d call this room organized – there’s not a hair out of place. 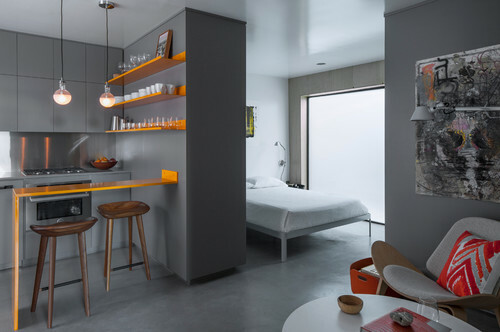 A wall separates the kitchen and small living space in this Venice micro-apartment. Deep gray walls, cabinets, and floors are the backdrop for simple decor. Yellow and orange work well as accent colors. Solar skylights add plenty of light to this West Midlands bedroom. 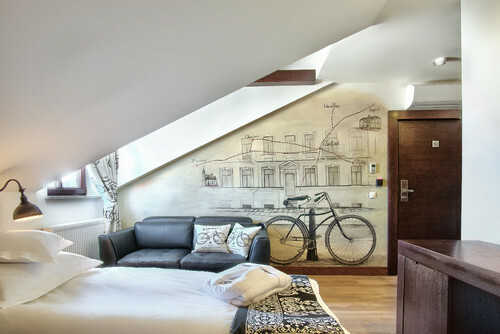 A wall mural of a street scene and bicycle propped against it create a design element that makes a lovely focal point. A chocolate brown accent wall draws the eye in this San Francisco studio. Notice the tiny office area tucked into the corner. Modern accessories complete the space. The designer of this oversized studio in Brooklyn created zones for living, eating, sleeping and dressing. Large, modern art leads the eye around the space.